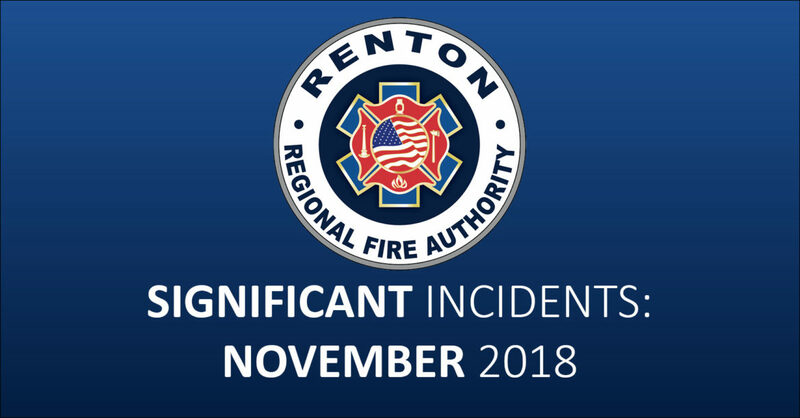 Renton RFA responded to 1,334 incidents during the month of November, 2018. Below are details on the most significant incidents that occurred throughout the month. On 11/4/18 Renton RFA responded to a building fire in Station 12’s area at the 500 block of Monroe Ave NE in the Renton Highlands. We responded with 3 engines, 1 ladder truck, 1 aid car and 2 officer rigs for a total of 16 personnel from stations 11, 12, 16 and 17. The cause of the fire was determined to be cooking oil being left unattended. There were no reported injuries as a result of the fire. On 11/4/18 Renton RFA responded to a building fire in Station 13’s area at the 17800 block of 114th Pl SE in the Benson Hill Neighborhood. We responded in conjunction with King County Medic One with 1 engine, 1 ladder truck, 1 aid car and 1 officer rig for a total of 9 personnel from stations 11 and 13. The cause of the fire was determined to be a grease fire that got out of control. The resident was injured with severe burns and transported to Harborview Medical Center for treatment. On 11/11/18 Renton RFA responded to a building fire at the 11300 block of 80th Ave S in Skyway. We responded in conjunction with Skyway FD with 2 engines, 1 ladder truck, 1 aid car and 1 officer rig for a total of 12 personnel from stations 11, 12, and 14. The fire was located in a wood shed attached to the residence. The cause of the fire was undetermined and is being investigated by King County Sheriffs. There were no reported injuries as a result of the fire and no one was displaced. On 11/12/18 Renton RFA responded to a barn building fire at the 12900 block of SE 203rd Pl in Kent. We responded in conjunction with Puget Sound RFA with 1 engine and 1 aid car for a total of 5 personnel from station 17. The cause of the fire was undetermined at the time of the incident. There were no reported injuries as a result of the fire and no one was displaced. On 11/14/18 Renton RFA responded to a residential building fire at the 10000 block of SE 2224th St in Kent. We responded in conjunction with Puget Sound RFA with 1 engine, 1 aid car and 1 officer rig for a total of 6 personnel from station 13. The cause of the fire was undetermined at the time of the incident. There were no reported injuries as a result of the fire and no one was displaced. On 11/30/18 Renton RFA responded to a building fire in Station 13’s area at the 16200 block of 123rd Ave SE in the Cascade neighborhood. 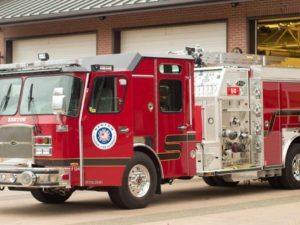 We responded in conjunction with Kent FD with 3 engines, 1 ladder truck, 1 aid car and 2 officer rigs for a total of 16 personnel from stations 11, 13, 14 and 17. The house was unoccupied due to being in the process of being remodeled. There were no reported injuries as a result of the fire. The cause of the fire was undetermined at the time of the incident. 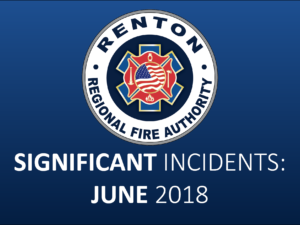 On 11/2/18 Renton RFA responded to a 2-car motor vehicle accident with injuries in Station 11’s area at the 2400 block of Maple Valley Hwy in Downtown Renton. We responded in conjunction with King County Medic One with 2 engines, 1 ladder truck, 1 aid car and 1 officer rig for a total of 12 personnel from stations 11, 12 and 16. 2 patients had to be extricated, were treated for injuries and transported to Harborview Medical Center. The cause of the accident was undetermined at the time of the incident. On 11/6/18 Renton RFA responded to a car versus pedestrian motor vehicle accident in Station 14’s area at intersection of Oakesdale Ave SW & 80th Ave S in the Renton Valley. We responded in conjunction with King County Medic One with 1 engine, 1 ladder truck, 1 aid car and 1 officer rig for a total of 9 personnel from stations 11, 13 and 14. 1 patient was treated for injuries and transported to Harborview Medical Center. The cause of the accident was undetermined at the time of the incident. On 11/10/18 Renton RFA responded to a fatality shooting in Station 16’s area at the 500 block of Elma Pl NE in the East Plateau. We responded in conjunction with King County Medic One with 1 engine, 1 aid car and 1 officer rig for a total of 6 personnel from stations 12 and 16. We assisted and helped the family by providing chaplain services due to the graphic nature of the tragedy. On 11/11/18 Renton RFA responded to a 2-car motor vehicle accident with injuries in Station 11’s area at Maple Valley Hwy and 140th We responded with 2 engines, 1 ladder truck, 1 aid car and 1 officer rig for a total of 12 personnel from stations 11 and 17. 1 of the 2 patients had to be extricated from their vehicle as a result of the accident. The patients were transported to Valley Medical Center. The cause of the accident was undetermined at the time of the incident. On 11/19/18 Renton RFA responded to an EMS call in Station 16’s area at Hazen High School in the Renton Highlands. We responded with 1 engine for a total of 3 personnel from station 16. A student was evaluated due to the occurrence of an absence seizure and released to their parents. 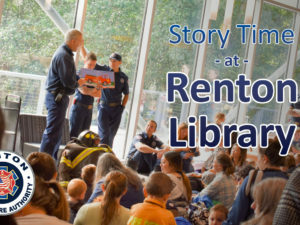 On 11/30/18 Renton RFA responded to a stabbing in Station 12’s area at the 3700 block of NE 4th St in the Renton Highlands. We responded in conjunction with King County Medic One with 1 engine, 1 aid car and 1 officer rig for a total of 6 personnel from station 12. The stabbing victim was transported to Harborview Medical Center with critical injuries. The incident was the result of a domestic dispute. 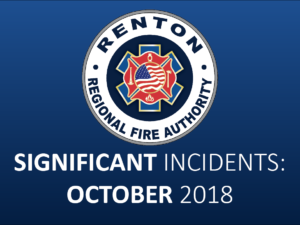 On 11/30/18 Renton RFA responded to a fatality shooting in Station 12’s area at the 900 block of Aberdeen Ave NE in the Renton Highlands. We responded in conjunction with King County Medic One with 1 engine, 1 aid car and 1 officer rig for a total of 6 personnel from stations 12 and 17. Resuscitation efforts were unsuccessful and the shooting victim died on the scene. The cause of the shooting was undetermined at the time of the incident.